Living lightly has not come naturally to me. I have had to be super mindful, learn and make an effort to be less attached, light hearted and forgive myself and others easily. Like everything even these qualities can be learnt. I have a very strong mind so it is easy to attach to my thoughts and feelings. I was born with a deep sense of guilt so judgement has been one of my main life lessons. But with my practice of Kundalini Yoga and meditation, I realise my life is a mirror. Shinning my consciousness on my weaknesses enables me to view my everyday challenges with loving reflection. When I get upset, I am mindful of my automatic response of blame. I am also mindful when I get a compliment, of wanting to claim it as MY victory. Through commitment to a loving practice of health, happiness and a wholesome approach to life, I am shifting away from my minds needs to a healthier energy where I can be patient and attract into my life what is needed. My experience has shown me that letting go doesn’t mean you lose everything, it actually means you gain everything. At a very physical level, letting go can be quite an emotional experience; however, when you start practicing it you will find a freedom and a positive momentum that helps you attract everything into your life. At first the very thought of letting go can tap into our fear programming that says, when we let go, we have nothing. There is very little truth in that fear, as when we let go of holding on to people, places and situations, we release the chords of attachment and merge more into a space of neutrality and non-attachment where we have the potential to make available “everything” to come to and through our experience. Notice letting go and being nonattached is not the same thing as Detachment. Detachment is opting out of life, being nonattached and letting go is the opposite. It is inviting in life, in a spontaneous way to surprise us and provide for us, while we are as present and conscious as we can be in every moment. Forgiving is also letting go, giving this moment forward into the next one. When you don’t forgive, you hold the moment you don’t move forward. A part of you is stuck in the sounds, tones and images of a moment that’s becoming the past. This attaches in your psyche where it will control you from the past. Releasing and no longer attaching, is like an exhale making room for the next inhale. You literally breathe life out and in with each full breath. Next time you feel yourself attaching, blaming, resenting, holding on to a moment, visualise yourself exhaling all the feelings, thoughts out of your body with the stale air. Allow the first chakra and 4th to eliminate what is no longer needed and with the inhale pre forgive yourself for that moment and all the others that will be coming along. Now try this meditation for letting go. Gunpati Meditation helps to reroute the mental pathways and renew the mind to heal the discordant energy and make way for everything that you could ever ask for in your life. 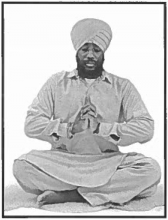 To Begin: Sit in an Easy Pose with the eyes 1/10th open while concentrating at the Third Eye Point. Place the wrists over the knees, with your hands in Gyan Mudra. Part I Chant the mantra on a single breath, as you press the fingertips sequentially with each syllable to the thumb. Use a monotone voice similar to when you do Kirtan Kriya. Time: Continue for 11-62 minutes. Part II Inhale deeply and hold the breath. Move the body in a slow twist and stretch motion. Move each muscle of the body. Move the head, torso, arms, back, belly and hands. Then exhale powerfully. Repeat this 3-5 times. Part III Immediately sit straight. Look at the tip of the nose and become totally calm and still. Meditate for 2-3 minutes. To End: Inhale and hold the breath for 30 seconds as you physically move and rotate your body as if it is going through spasms. Move and squeeze every muscle. Repeat this 3 more times. Then inhale, sit calmly and concentrate on the tip of your nose for 20 seconds. Exhale, and relax. This kriya allows you to let go of the attachments to the mind and to the impact of past actions so you can create and live a fulfilled life and a perfect future. Learn to let go of EVERYTHING you are holding on to so dearly and just wait and see what the Universe will provide for you. You just never know; it might be even better than what you didn’t’ want to let go. Let it Go. Let Life flow to you and give you everything your big heart desires. The Power of Real Prayer? Very simply it is when you ask for a higher power or authority to intervene. In the Piscean Age, Religion taught you to look outside yourself for miracles. Religion should have taught you to call on your higher self in prayer. We tend to pray when we are desperate, insecure, lost. But you can also live in gratitude and that is living in prayer. Prayer is actually gratitude. You are the miracle you want to create, you are the divine, so learn to pray to your heart your soul. Prayer comes from the heart not the head. Love comes from inside your heart just as prayers come from inside you. When you practice this you become bright, beautiful and trustworthy. Anytime you pray from outside you, you are trying to pressurise the situation to create a result. You are trying to use force not love to create change. The brain stem is the control centre for your total personality, projection and progression. Once you start vibrating from the brain stem like an expanding wave into infinity you unite the finite and infinite in you. This is prayer that works. If you want more peace, feel more peaceful. If you want more prosperity, feel more abundant. If you want more joy, feel joy bubbling up from the depths of your being. The first step is to learn to send vibrations out, become a beacon of vibratory power of your soul. This vibration flowing out of you is prayer. It will meet all challenges unto infinity. When you expand into your vastness, your greatness, your Great Spirit, your great soul. You will really understand prayer and the power of it, the power of you. Mudra: Interlace the fingers so the left Mercury finger (pinkie) is on the outside. Extend the Jupiter fingers (index) up straight. Cross the thumbs, so right is over left. Place this mudra in front of the Heart Center so the thumbs are very close to the chest, and the Jupiter fingers are pointing straight up toward the ceiling. The elbows will be bent. Eyes: Closed or 1/10th open. Focus: Build an image of yourself. You are still and radiant. Your breath is slow, deep and meditative. Imagine you are sitting on the top of Mount Everest, so all the world is around you. Consider your spine is like a tube of light. There is light between the base of your neck and the base where you are sitting. Now it is sending out light rays. You can send waves to the entire globe with each thought. Your prayer is like a stone, which is dropped in the middle of some water. It creates waves and ripples. Feel yourself as the waves and ripples go on and on unto Infinity. The power of your soul is the pure power. Let the power of your soul vibrate out. It has no limit or boundary. With each breath and with the ripples of your heartbeat, project, bless, and be blessed. Merge in Infinity and let Infinity find you too. Time: 11 minutes, 31 minutes maximum. To End: Do heavy Breath of Fire, holding the position to awaken yourself out of the meditation. Continue for 1 minute. Then stretch the arms out to the sides, forearms bent up at about a 45-degree angle, palms down. Begin circling just the hands, right hand counterclockwise and left hand clockwise, in 6-inch circles. Don’t just circle them. Stop every so often as the hands are up and out to the sides, and flutter your fingers a little, as if you are sending off energy to the environment and space around you. Saturday 26 Sept meet us at the Good Market for a FREE CLASS.